One of my absolute favorite things about spring is asparagus. It’s one of those vegetables that I used to hate as a kid because I only ever had it mushy out of a can…once I discovered the real thing, I was hooked. Of course, the season for fresh, local asparagus is short everywhere, but it seems it is even shorter on Nantucket: as in no Nantucket-grown and only one or two weeks when the asparagus at Stop & Shop wasn’t from Mexico. I looked religiously starting in early March and had just about given up hope on an American asparagus when some finally appeared a couple of weeks ago. Needless to say, I bought a lot of asparagus. A lot. We ate asparagus for breakfast, lunch, and dinner (luckily Nora likes it too), as a side and as a main course, for two weeks. This recipe was one of the happy discoveries of our asparagus-fest. 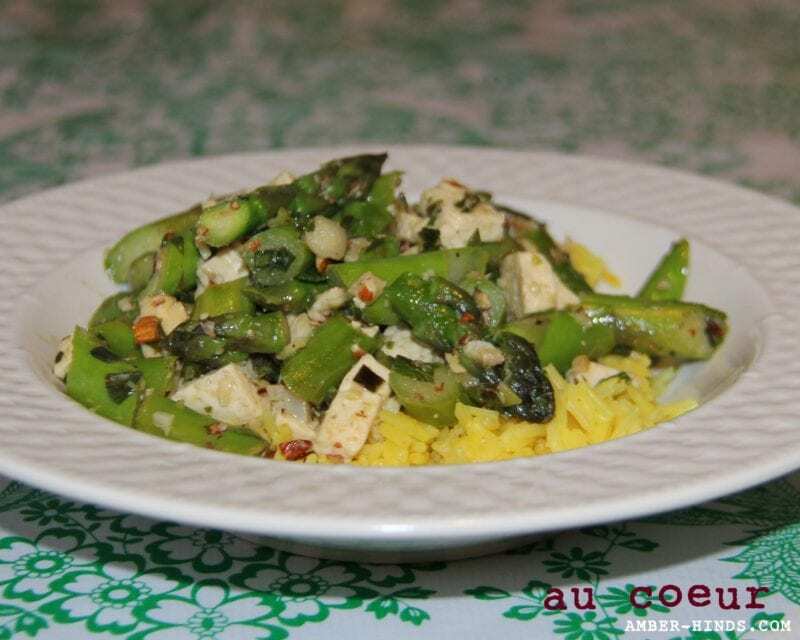 It’s based upon a recent Vegetarian Times recipe (here I am, adapting again), Lemony Minted Asparagus with Saffron Rice. The biggest change I made to the recipe was the addition of tofu for extra protein and because Nora loves it. There were a bunch of little changes, too, and I was very happy with the final product, which made two great dinners in a row for us, plus yummy filling for wraps at lunch the third day (with lettuce, tomato, cheese, and aioli). Hopefully you still have some good asparagus around and won’t have to wait a whole year to try it. Meanwhile, heat wok (or large skillet) over high heat, until water droplets evaporate within 1 second. Add oil, swirl to coat pan, then add green onions, chilies (if using), and garlic; stir-fry 1 to 2 minutes, or until onions turn bright green and soften, Add asparagus, tofu and broth, and stir-fry 2-4 minutes more, or until asparagus is bright green and tender and vegetable broth has cooked off. Remove from heat, stir in almonds, mint and lemon juice, and season with salt and pepper, if desired. Fluff rice, and spoon onto serving plate. Top with asparagus mixture. The asparagus looks terrific!! Beautiful pics! Where did it come from? Sounds great to have in wraps also. Glad Nora likes it–a lot more fun to make if entire family likes! You’re a very conscientious and healthy cook.